Christina and I went to Clemson last weekend and stayed at the Hampton Inn Clemson. Read her review. 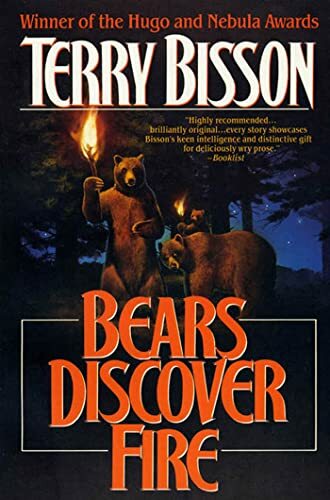 OK, I admit it; I bought this book in large part for the title, and the cover (sadly not available at Amazon), which shows bears with torches. A large version of the cover is now available here. I had been meaning to read The English: A Portrait of a People before one of my trips to the UK. I finally got around to reading it during our trip there last month. I don't know that I learned anything particularly profound out of the book, but it was an entertaining companion with some interesting trivia facts. The book centers on the question of English (as oppposed to British) national identity. The author traces a strain of anti-intellectualism and tries to tie it, along with other traits, to a concept of Englishness. I'm not sure I buy that, but some of the insights are worth thinking about, especially for a foreigner like me. This is another book I'd been meaning to read for a while. It has a fairly provocative thesis -- that rather than trying to protect our privacy, we should demand openness from others. So if a company gets our address, we should have the right to know exactly what they are doing with it. And the home address of anyone on their board of directors. There's a lot interesting there -- like the contrast between American fear of Big Brother and European fears of corporate privacy invasions. Brin admits that he is not an absolutist -- he wrote the book in part to counter-act what he saw as people too concerned with "how do I keep my personal information secret" and less willing to consider regulation about how the information is used. This book might as well have been subtitled "Ice Cores, Ice Cores and More Ice Cores". The author spends the first part of the book explaining how ice cores (specifically, drilling two miles deep in Greenland) can tell us about climate history. It's fairly dry stuff, but I followed along on the promise that he would use this set-up to help explain possible future climate changes. Unfortunately, when he gets to that stuff, he doesn't go into much detail, and instead returns to the details of the ice core experiments. It's always amusing to see how someone's obessions creep in despite their best efforts, but in this case, it makes for an unsatisfying book. My father had a letter published in the Arizona Daily Star. Hey, I'm giving a talk at Clemson next Friday. Guess I'd better go write the talk. I've created a web page listing the World Heritage sites I've been to. I link to the official UNESCO page for each site, as well as to a description of my trip there, if available. I'm hoping to go back and provide descriptions of trips where not available. Given how much I travel, I'd like to update and expand the travel section of my web site. I have a travel page that needs freshening. On the other hand, as the war drags on, any stifled sympathy for the American invasion will tend to evaporate. As more civilians die and more Iraqis see their "resistance" hailed across the Arab world as a watershed in the struggle against Western imperialism, the traditionally despised Saddam could gain appreciable support among his people. Well, at least he said "could". And I'm not saying I'm a better prognosticator. But it's interesting how little value this analysis contains only eight days later. I mean, the fighting's not over, but Saddam's regime isn't exactly showing its tenacity. Tuesday night was spent at the Little Owl Pub for dinner. We participated in a game of skittles. No, not the candy. When I asked what skittles were, I was told that it was like tenpin bowling, but with nine pins that were differently shaped and further apart. You get three throws to attempt to knock them down. 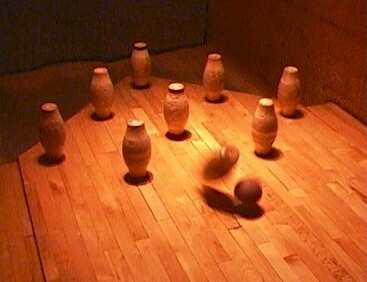 I suppose if you knocked them all down with one of your first two balls, the pins would be reset. Between the 30-40 people we played with and the four frames bowled, this was never an issue. One time, someone did knock all nine down, but that was with ball three. I had the most fun setting up the pins. This was certainly not automated -- the pins weren't even regular. Though they were supposed to be symmetrical, some wouldn't stand up on one side. And yes, Christina did out-skittle me. Left handed. I mentioned visits to The Belgian Monk in Cheltenham last year and in 2000. After less than superb dining experiences, I decided to skip the food and only go there for the Belgian beer. Well, they've moved, changed the name, are "under new ownership" and have a new menu. They don't open until today, so I didn't get a chance to go there, but at some point, you're not really talking about the same restaurant, are you?